I loved the movie Secretariat! It was awesome. It is based on the true story of housewife Penny Chenery who takes over her father's Meadow Stables. Even though she doesn't know anything about racing horses, she ends up with Secretariat who won the Triple Crown and is considered one of the greatest racing horses of all time. It's a Disney movie, and they did a good job. I read in Horse magazine they used 8 different horses to play Secretariat, and they had to put make up on each one to make them look the same! I could tell the difference...can you? I was a little worried that I wouldn't like the fact that it's about horse racing. A lot of horses that are raced end up just being dumped after they aren't making money, and I am not crazy about that. I know some horse rescue organizations have to step in and try to take care of these horses. It's a hard life. But overall I thought the movies was really really good. What do you think? I love this movie! My sister and I have watched it so many times. If you're looking for a good movie, this is the one! This is my all-time fave movie! I've watched it about 6 times now! I love the bond between horse and owner, and yeah, I could tell the difference between each of the horses, and Secretariat was so funny, posing for the camera! It really captured the beauty of horse racing. Even non-horse lovers will like this movie. I think it was based on his owner too much because you didn't get to know Secretariat's personality. It totally left out Riva Ridge, the horse who won the Kentucky Derby for Penny Chenery the year before. Overall, while I think they could've done better, I think this was a great movie. I watched it not that long ago and it was a good movie! This is an amazing movie! I love how they make the races so real! The speed, energy, and power of the horse shows in the races! It's definitely a movie deserving of high rating. I love this movie. The Best Part Is the race! I love Secretariat. I love the big race when Sham & Secretariat are neck and neck then Secretariat takes the lead and everybody is like he can't run at that speed! .. But he does...!! this is a great movie loved it!! like i said in the title it's ok. I have seen others like it. But it is a good movie. I like it. this is an awesome movie! it is about penny chenery and how she trained secretariat to race. It really shows her struggle of being a women in a men's world trying to push through when everyone keeps telling her that she cant do it. It shows the bond that she had with the amazing team that secretariat had. this movie is rated PG and it is because they have a few swears in the movie. my 10 year old sister watched it, and she said that she loved it! " it's an amazing movie" she said. This movie will run to your heart! I love Secretariat, it is so good! i've seen it ummmm.. 53 times including today. it is so good, it is so amazing the way Secretariat runs. And in the end he wins by 31 length's, and those who don't know what that means, it means that if you measured Secretariat and then you could fit 31 of him between him and the second pace horse!!!!!!! I watched Secretariat not too long ago, my mom saw it in ASDA and immediately bought it due to my family's love for horses. My older sisters weren't so bothered, so I watched it with my mom. Secretariat is touching, it's beautiful, it shows the true power of a horse. Secretariat is the greatest racehorse who ever lived. After watching the film, I youtubed the original clip from that phenomena race, and it was just as amazing as the movie. This is such a good movie!! It's actually a true story too! i couldn't believe it! Secretariat is one of the best movies I have ever seen!! My dad, who was a cowboy and is totally for western, enjoyed it immensely! it's about a very great red colt who wins the triple crown by lengths in a mile in a half race at belmont park. i think it's amazing movie. it's very loving story. i think it's one of the best movies i've ever watched. i could never stop watching it. i've watched this movie a hundred times and i still love it! This movie is awesome! I saw it twice with my friends while it was still in the theater. Before I watched it, I just knew Secretariat was some famous race horse. Afterwards, I knew tons about him and his owner. I didn't even know what exactly the horse was famous for before I saw the movie. Any horse lover should definitely watch it! it's hard to believe it is a true story but it is! I cried when he won the triple crown. I rented it a few months ago, and it was so awesome! I watched it over and over again, and then we finally got it on blu-ray! Best horse movie ever!! love the part when secretariat won the triple crown. thanks to the movie, secretariat is my fave thoroughbred. I luv the movie!!! It's a thrilling movie about not only a wonderful horse and race but an awesome owner who is tough and ready to fight!!! I think all horse lovers in the world should watch this movie about a thrilling story of a trainer, owner and her family. Please enjoy this movie next time you get a chance!!! I saw this movie and I absolutely fell in love. Bought the DVD watched it a good ten times. And I still want to watch it now. Its one of my favorite movies of all time besides 3 other movies. I HIGHLY recommend it!!!! Secretariat was a very cool movie, but in some parts it was a little boring but when Big Red/Secretariat raced it was palm sweating, heart raising, it was awesome! I would recommend that you watch the movie. Very cool I'll give it a 4 out of 5! I loved Secretariat. It is definitely a top horse movie! Go Secretariat!!!!!!!!! this movie is the best movie that i ever watched!!!! but for half of the movie it was just talking. but the horse was in the middle and at the end it was talking and about the horse. I love this movie. It makes me want to do something amazing. It's really inspiring. OMG! I totally loved this movie! There is not one second when nothing is going on. I watched this movie 4 times! I totally recommend this movie! I absolutely LOVED THAT MOVIE!!!!! It was and is amazing .Though I heard it took 12 horses to play Secretariat. I find Penny Chenery and extremely influential person and I think that she is a very good role model. Hi this movie is the best. i have the book i think it will be a great success. I recently saw this, and I fell madly in love with this horse. An absolutely amazing film, I loved every bit. An absolute MUST for all horse-movie lovers. Best movie ever! The story is so amazing and makes me want to go riding at that second. Really powerful story. I could watch it over and over again. I haven't seen this movie advertised in the UK yet and I really want to see it :( does any one know when its coming out? I rented secretariat. i LOOOOved it. I will get when i see it. I ADORED this movie! It was really inspiring and the story is truly magical. The best is that it's a true story! And Secretariat is really a beautiful horse, which makes it an even bigger pleasure to watch the movie. Enjoy! omg it was so good, i cried. The Greatest Racehorse the World Have Ever seen in horse racing. The Best Triple Crown Champion In the World(setting a record of 2 min 24 sec in 12 furlongs-11/2 also winning by a magnificent gap of 31 lengths).I Even Gave Him The Title Called "The King Of ALL Colts." I have watched this movie about 20 times since it came out, and I am still in love with it! I watched this movie 2 or 3 times already, i loved it so much! i wanna to see secretariat 2. i hope they are making it. I just saw Secretariat yesterday it was good!!!!!!!!! This is the greatest movie I've seen in the theaters! It follows the true story really closely, and is completely family-friendly. I loved this movie!!!! when it comes out I'm buying it. The horse that boarded at my barn played in the movie. He was in the part where secretariat got a mouth sore. I love this movie, it's funny and good. I thought the penny character was predictable and unlikable. the movie wasn`t even about the horse. 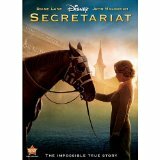 Secrtariat is my favorite horse movie. It is the only horse movie I've seen that the horse doesn't get hurt. it is not said at all. This is an awesome movie. I really recommend it for any of the horsecrazy girls. My favorite part when the cutest little foal is born! Watch the movie and find your fave part! Secretariat is a great and breath taking movie! OMG! I saw the movie and fell in love with him and wow he was and is the BEST race horse who ever lived! I went to see Secretariat and I loved it. It was great. It was about a race horse that became a legend. It is based on a true story !If you haven't seen it yet, you should!!! i saw it the day after it came out! i <3'ed it it was soooooooo cooooool! i would recommend it to everyone! Everybody is telling me Secretariat is a great movie and everybody says that I should go see it. I can't wait to see it and I love the book! I've read it 4 times it never gets boring! I always get dissolved in it and I read it within 2 days with lunch, breakfast and dinner. If somebody tells me one more time that it's great I am running to the movie theater and watching it. Sorry, I haven't been on for a while. Yeah! I saw Secretariat yesterday at the movie theater! It was awesome! He actually won the Triple Crown! In Belmont, he won by 31 lengths! WOW! It was a truly amazing movie. I saw it today on its opening day!!! I have the book and I'm on chapter 7. The first chapter tells about the birth of Secretariat. The rest until chapter 7 tells how meadow farm started, and all the generation of horses until his birth. this movie actually came out on the 2nd, so I went 2 see it. It is such a great movie, one of the best horse films, especially racing, that I have seen in a long time! It beats Dreamer! MUST SEE!!!!! This was an amazing movie! I just saw it last night and it was incredible! The horse racing scenes were very detailed and during some I even leaned forward in excitement or frustration. They had some slow-motion parts in the movie too, where you could see each tiny ripple of the horse's muscle as it crossed the finish line. I absolutely love this movie, and I can't wait till it comes out on DVD so that I can watch it again! I have very good connections when it comes to movies and I got to see it with one of the actors who is my sister's best friend AJ Michalka during the premier. I have to say, It is one of the BEST movies I have EVER seen!! At one point in the movie it has actually footage of the REAL races! It is a lot funnier than the previews get credit for there are many many times where I found myself laughing sooooo hard. Plus at the end the real life Penny Chenery made an appearance in the movie and at the end they credits do not let that go unrecognized. They immediately tell what happened to the real life people and point her out in the crowds. Secretariat is truly an amazing movie! If you are so happy to see the movie maybe you should read the book. See my mom has it and she says it is a great book, but she is almost done with it and she said she would let me read it. even though it is really long i think it will be good!